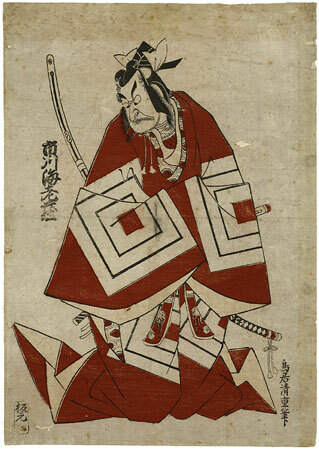 Ichikawa Ebizō is depicted here in his family’s most famous role, in which he suddenly appears as a “deus ex machina” with the cry of “Shibaraku!” (“Stop right there!”)and then keeps villains from committing evil deeds at the last minute. His costume bears the family’s crest of three rice measuring boxes. An interesting contrast is provided by the comparison with a print by Torii Kiyomasu I from 1714, showing a still young Danjūrō II in the role of a fan seller (cat. 26). Three impressions of this powerful design are known, each of them in a different state. The earliest, in the Grabhorn collection in San Francisco, bears long printed inscriptions above the actor clearly identifying the play as mentioned above. The print was reissued at a later date and the name of the play was removed. The Riese impression belongs to this second state. Dr. Hempel argues very plausibly that the print was reissued in 1750 or 1753 when Ebizō again acted in this role. Ebizō died in 1758, and the last state of the print, with the actor’s name removed, was probably published after this date. A very late and worn impression of this final state is in the collection of the Staatlichen Kunstbibliothek in Berlin. (Catalogue no. 42). It is unclear whether Kiyoshige invented this design, or whether it is derived from a votive painting of an earlier date. Be that as it may, it is certainly one of the most impressed versions of the ‘Red Danjūrō’ known.